Update: 12 October 2010. Howard Jacobson’s ‘The Finkler Question’ has won the 2010 Man Booker Prize for Fiction. There are two points that I want to get across in this review, and pressed for time and lacking in talent, I’ve decided to forgo subtlety: 1) The Finkler Question is very funny, 2) The Finkler Question is very Jewish. Like Woody Allen, as literature. Julian Treslove is a middle-aged former BBC radio producer now working as a celebrity look-a-like. His face is so “vague” that he can pass himself off as anyone from Brad Pitt to Billy Crystal or Colin Firth without soliciting any hint of doubt or scepticism from his clients. Ironically (yet somewhat fittingly) Julian is suffering from an identity crisis. His only friends are Libor Sevick; a ninety-year-old Czech Jew, and Sam Finkler; a Jewish philosopher and television personality in the mould of Simon Schama – only more acerbic. Both these men are recent widowers, and their loss somewhat steals the thunder of Julian’s identity crisis. He is jealous of their Jewishness, he is jealous of their closeness; he is even jealous of their grief. In order to reconcile his newfound Jewishness with his predominantly secular upbringing, Julian turns to his friend Sam Finkler for inspiration. Julian imprints on Finkler, and views him as the archetypal Jew; most of the narrative even substitutes the word ‘Jew’ for ‘Finkler’, thus the book’s title becomes a rather strange play on the concept of ‘The Jewish Question’, as every action Sam makes is over-analysed by Julian, in a futile effort to capture and define what it is to be Jewish. But don’t be fooled; The Finkler Question is not really just a comic ‘beginners guide to Judaism’ told through the eyes of the Gentile convert. I offer you a warning: there’s an elephant in the room, and it’s wearing a Yarmulke. Behind the novel’s humorous take on modern Jewish life is an incredibly dense and loaded examination of modern Jewish politics. Much of the narrative is given over to long discussions of such zeitgeisty issues as Jewish anti-Zionism, Palestinian aggression and whether or not apologists for Israel are, in their own way, anti-Semitic. This is all well and good, but the problem is that such political posturing dominates the narrative to a detrimental extent. Politics has its place in fiction, of course it does; but parts of The Finkler Question don’t even feel like a novel; it’s as if Jacobson used the framework of ‘a novel’ as an excuse to air his political ideas and cultural mapping. Everything I’ve mentioned thus far – the comedic take on Jewish life, the examination of male friendship and the quest for personal identity – all of it plays second fiddle to the novel’s political agenda. Jacobson is constantly slapping the reader in the face with the smorgasbord of anti-Zionism. Somewhere in The Finkler Question are two very good books; a modern-day comedy of manners, and an essay on apologists for Israel; but the two just don’t gel well together, something in their union has gone terribly wrong. 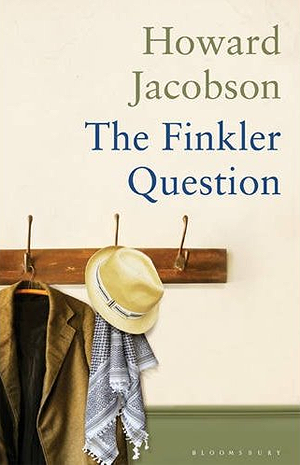 It’s frustrating because, aside from all this dumping of political ideology, The Finkler Question is very well written, very funny and can be very moving. The novel is most successful when comedy converges with pathos. The protagonists’ personal successes and defeats are much, much more interesting than their political opinions. Libor’s love and grief for his dead wife is heart-breaking, and the short scenes featuring this character are among the novel’s best, as he dedicates his life to her memory. He even takes up the piano, in order to recreate the music they loved together. But this accomplished and moving portrayal of loss is never leaden or over-played. It’s beautifully counter-pointed by some characters of inspired comic creation; such as Alvin Poliakov, a Jewish internet blogger who dedicates his life to attempts at re-constructing his missing foreskin, and who broadcasts his efforts (and inevitable failures) over the internet for all see. It’s a brilliantly bathetic narrative contrast to Julian’s obsession with later-life circumcision. In a way, The Finkler Question is a victim of its own success; that it manages to make a comedy out of such a loaded subject as grief is just sublime, so much so that Jacobson’s politics and ethics seem uninteresting by comparison; they just get in the way of the book’s emotional heart, where things are most interesting. I’ve not been so torn by a book in a long time. The Finkler Question is almost, almost perfect – if it could be re-edited to cut-out the heavy-handed politics and moral debate (or maybe just to tone it down), it’d be a significantly better novel. I wouldn’t be surprised if it did manage to sweep in from left-field and win this year’s Booker. But, thus far (I still have several nominees to go), it’s not my over-all favourite. Jacobson’s political theory is interesting, but misplaced; I’m sure it’d make a fascinating book of essays. The political barrage doesn’t ruin the novel, but it does damage it. As such The Finkler Question comes highly recommended, but with a caveat – be wary of the book’s political agenda. I’m sure that certain readers will indulge in the moralising and political affectation; but for me, this novel’s supplementary, subtle themes of grief, friendship and identity are much, much more interesting. This entry was posted in Novels, Reviews and tagged Booker Prize 2010, Booker Prize Winner 2010, Howard Jacobson, The Finkler Question. Bookmark the permalink. I laughed quite a lot reading this book. The language is just a like a music for reading. The character of protagonist’s depicted is I felt bit unrealistic. Nevertheless, one will not be disappointed to buy this book. As an outsider to Jews culture, at times I do not quite follow the book. I mean the ceremonies and strange behavior of Finkler’s wife when she is bed with Treslove.